We’ve been designing this technology into our lighting for three years and our customers are very happy with the results. We’re excited to offer it in a new form that is easy to install and extremely cost-effective. 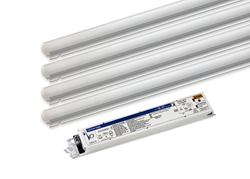 Retrofitting fluorescent lighting with LED benefits both your operating costs and the environment. Now you can also make a positive impact on the safety and well-being of building occupants by retrofitting outdated fluorescent fixtures with LEDs using Indigo-Clean Technology. Luminaires using Indigo-Clean Technology combine white, ambient light with 405nm Indigo light in order to safely and easily kill harmful bacteria, including Staph*, such as MRSA** with the flip of a light switch. The 405nm light penetrates harmful bacteria, targeting naturally-occurring molecules within the bacteria to produce intra-cellular Reactive Oxygen Species (ROS). Similar to bleach, these ROS create an oxidative environment that kills the bacteria. This budget-friendly, easy-to-install kit can retrofit any manufacturer’s lensed product (optimal aesthetics achieved with an opal or frosted lens). The kit provides the perfect solution for facility managers to upgrade existing lighting without disrupting the ceiling. The new retrofit kit is part of a large portfolio of lighting products that Kenall has developed using Indigo-Clean Technology. “We’ve been designing this technology into our lighting for three years and our customers are very happy with the results. We’re excited to offer it in a new form that is easy to install and extremely cost-effective,” said Frank Gonzales, Kenall’s Director of Product Management. Kenall Manufacturing was founded in Chicago, Illinois in 1963 and has built a reputation for durable lighting solutions of superior quality and exceptional value. Today, the company focuses on the healthcare lighting market as well as creating unique solutions for the high abuse, transportation, food processing and correctional lighting markets. Kenall luminaires are designed and manufactured in the USA and meet the guidelines established under the Buy American Act and the North American Free Trade Agreement. For additional information, visit http://www.kenall.com.